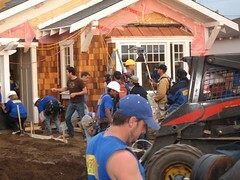 An interesting show to watch is Extreme Makeover Home Addition. It is quite an amazing process when they can take what looks like hopeless situations and turn dilapidated houses into dream homes. Have you ever noticed where they typically start with a house about to be made over? Ty Pennington, one of the stars and host of Extreme Makeover, can often be found starting the show in the basement of the house selected for an Extreme Makeover episode. Ty is checking for structural issues, leaks, shifts in the soil, the wiring, and many other areas related to the determining how solid the foundation is for the house. It is not surprising that in many episodes, they wind up razing the entire house and building new as a result of the foundation being weak. To redo a house as in Extreme Makeover, it begins as a process with very distinct stages. In other words you cannot put up a roof until you have a foundation and the frame of the house has been established. Similarly, with buyer personas, they can be created with tremendous meaning when they are grounded in qualitative and experiential analysis that is focused on buyer goals and have been created through a process-oriented methodology that also has distinct stages. The buyer persona itself is meant to be an archetype of buyer goals that are derived from foundational qualitative and experiential analysis with real and potential customers. They in of themselves are not the end means. In many ways, the process of creating them is far more relevant to informing goal centered customer strategy than the actual buyer persona itself. This concept is very foundational to the origins of personas as well when personas were a means to inform goal directed design strategy and served as the communication vehicle and archetype of user goals. In the next few years, it is my belief that the need for buyer persona strategists will grow and that the pendulum will swing back to the origins of a goal centered approach to buyer persona development. Executives will see tremendous value in the foundation of qualitative and experiential analysis in informing them on evolving buyer goals and behaviors. Which will serve as foundational guidance for making important decisions respective to customer strategy. Buyer persona strategists of the future will become a unique specialty in the sense that it will require the convergence of attributes and skill sets in the areas of strategy, ethnography, anthropology, sociology, and qualitative analysis.